Below are listed all the references to specific dates mentioned in the Animated STAR TREK series. The series spanned a mere 22 half-hour episodes, but a wealth of past history was revealed in those few adventures. Listed also are a few key historical points that are related to the animated series, such as the birth years of certain characters. In addition, references are made to those original STAR TREK series episodes which were spun off as animated sequels. The format used in this timeline is esentially similar to the one employed in Mike and Denise Okuda's STAR TREK Chronology. The timeline was written in the past tense as if the writer were living in the STAR TREK universe a few years after the current adventures. Text in italics are comments made by the writer in our universe, the one in which STAR TREK was a television show. Details concerning Assumptions and other Criteria used in making this timeline are available. The galaxy-wide Slaver Empire is destroyed when one race revolts against the Slavers. Most intelligent life of this time is destroyed, and the only remnants of the Slaver Empire are stasis boxes and their contents. One such stasis box, containing a flying belt, will be the key to the artificial gravity field used by starships. Another will contain a disruptor bomb. Yet another stasis box will be found on the planet Kzin in 2269. This box will contain several items including an immensely powerful weapon which has a total-conversion setting. "The Slaver Weapon." One billion years before the episode, (2269). An alien ship of insectoid beings is invaded by a magnetic organism. Trapped in orbit of Questar M17, the crew disable their own ship to prevent the spread of the entity. "Beyond the Farthest Star." 300 million years before the episode, (2269). The so-called "Shore Leave" planet is established by an unknown alien race. "Once Upon a Planet." 7009 years before 2268. Inscription on the Caretaker's grave marker stated that he had died in the 7009th year of the planet. He must have died after "Shore Leave" (2267) but before "Once Upon a Planet" (2269), so it is conjectured that the 7009th year was 2268. Akharin is born in a region of Earth later known as Mesopotamia. He will later learn that he is immortal. Akharin will lead hundreds of lives and be known as such men as Methuselah, Merlin, Abramson, Leonardo DaVinci, Johannes Brahms, Mr. Brack, and finally Flint. He will survive into the 23rd century. The Mayan culture arises on Earth. Kukulkan, a benevolent alien being, assists the Mayans in their development. The Mayans will survive into the 10th century. Historical accounts. "How Sharper Than a Serpent's Tooth." Kukulkan said that he visited the Mayan civilization on Earth and taught them important things. The Aztec culture begins on Earth. The Aztecs are nurtured by the long-lived alien being known as Kukulkan, and will fluorish into the 16th century. Historical accounts. "How Sharper Than a Serpent's Tooth." Kukulkan said that he visited the Aztec civilization on Earth and taught them important things. Within the Delta Triangle region of space, in a different time-continuum, the Elysian council is formed. By 2264, Elysia will contain members of over 123 different races. "The Time Trap." More than 1000 years before episode, (2269). The people of Megas-Tu are forced to leave Earth in Salem, Massachusetts, New England. "The Magicks of Megas-tu." Spock mentions the date. Curt Danhauser is born in New York on Earth. He will become a United States Naval Officer and serve on the Guided Missile Cruiser U.S.S. Horne (CG-30). In the mid 1990's he will establish a presence on the Internet. The Eugenics Wars comes to an end. Dr. Stavos Keniclius, Earth's first cloned human, is banned from the community. The tyrants' altered Humans are declared wards of the United Nations and are sent to live in a series of camps in isolated areas. Gene engineering of Humans is banned, although certain groups will pass on the forbidden knowledge. "The Infinite Vulcan", "Space Seed." April 4th. The Phoenix, Earth's first warp-driven spacecraft, is launched by Zefram Cochrane. His flight attracts the attention of the Vulcans who make first contact with him in Montana the next day. The Kzinti, a race of felinoid warriors, invade the Sol system. They will engage humankind in wars four times before being ultimately defeated in 2069. "The Slaver Weapon." Sulu stated that the Kzin fought four wars with humankind, and that the last one was fought 200 years prior to the episode, (2269). The first Man-Kzin conflict must have been after 2063 since that was the when Earth first encountered extraterrestrials. ("STAR TREK: First Contact.") Also the Kzin were defeated because of Earth's warp-drive technology which was first demonstrated in 2063. The first Man-Kzin war must have been around 2064 to give enough time to fight four wars. The S.S. Valiant embarks on a deep space exploration mission. The expedition is lost and is eventually swept out of the galaxy. The ship is nearly destroyed while trying to return across the energy barrier at the outer edge of the galaxy. In the transit, some crew members gain dangerous ESP powers. The Kzinti and human kind engage in war for the fourth and last time. The Kzinti are once and for all defeated by Earth forces. The Kzinti are defeated because of Earth's development of warp drive. The Treaty of Sirius prevents the Kzin from possessing any weapons except for police cruisers. "The Slaver Weapon." Sulu stated that the Kzin fought the last war with human kind 200 years prior to the episode, (2269). The Skorr, a race of avian beings, long existed as a warrior race with advanced technology and the ability to breed vast armies very quickly. Around 2069, a great Skorr philosopher, Alar, lead the Skorr into a new era of peace. After Alar's death, his thought patterns were preserved in an indurite sculpture referred to as the "Soul of Skorr." "The Jihad", 200 years prior to the episode, (2269). The tenth and last Space Ark, Terra 10, is launched complete with early transporter technology. Of all ten generation ships, only the passengers of this last ship will survive. "The Terratin Incident." 200 years before the episode (2269). The Taurean star system is briefly explored and a spaceship is lost near there. Over the next 164 years, a ship will disappear in this region exactly every 27.346 years. "The Lorelei Signal." For a ship to have disappeared exactly every 27.346 years and for the next ship to be due to disappear in 2269, the first ship would have to have gone missing in 2105 which is 164 years ago not 150 as stated by Kirk in "The Lorelei Signal." It is assumed that he was simply speaking in round numbers. The S.S. Bonaventure, galactic survey cruiser, the first ship to have warp drive installed, is launched. The Bonaventure will mysteriously disappear on her third voyage, and her hulk will be found in 2269 in the alternate universe of Elysia. "The Time Trap." Date is semi-canon conjecture. A second spaceship disappears in the Taurean region of space, never to be heard from again. "The Lorelei Signal." 27.346 years after the first ship disappeared, (2105). The women of Taurus II claims the crew of a third spaceship. "The Lorelei Signal." 27.346 years after the previous ship disappeared, (2132). Another space ship disappears without a trace near Taurus II. "The Lorelei Signal." 27.346 years after the previous ship disappeared, (2159). Robert April, future first captain of the Constitution-class U.S.S. Enterprise, is born. He will later become a Federation ambassador-at-large. "The Counter-Clock Incident." Seventy-five years before the episode, (2270). A spaceship in the vicinity of the star Taurus disappears forever, victim of the women of Taurus II. "The Lorelei Signal." 27.346 years after the previous ship disappeared, (2187). 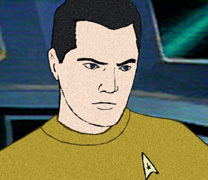 Montgomery Scott, future chief engineer of the original U.S.S. Enterprise, is born. Leonard H. McCoy, future chief medical officer of the original U.S.S. Enterprise, is born. Spock, future first officer of the original U.S.S. Enterprise, is born on Vulcan. James Tiberius Kirk, future captain of the original U.S.S. Enterprise, is born in Iowa on Earth. On Vulcan, Spock, at age five, pulls a practical joke. "Yesteryear." In 2237, Young Spock stated that he pulled a practical joke two years prior. 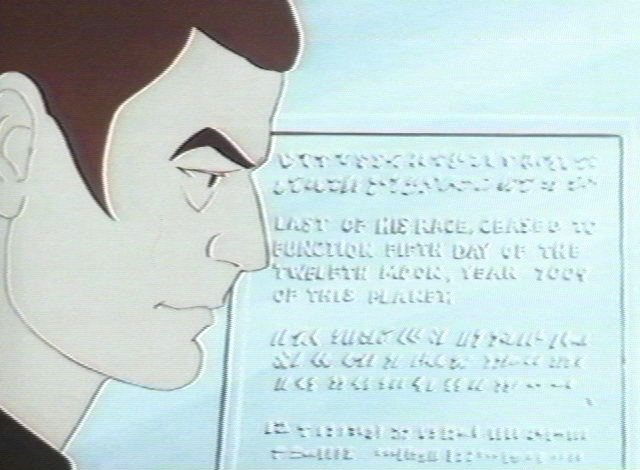 On Vulcan, Spock, at age seven, is tormented by other young Vulcans due to his half-human heritage. His mother, Amanda, is consequently disturbed. Spock attempts the Kahs-wan ordeal on Vulcan a month ahead of schedule. His life is saved by his cousin Selek (actually Spock from the future). In an alternate timeline, Spock attempts the Kahs-wan ordeal on Vulcan a month ahead of schedule, and again, his life is saved by Spock from the future. However, in this timeline Spock's pet sehlat, I-Chaya dies. In another alternate timeline, Spock dies at age seven undertaking his Kahs-wan test. His parents separate after his death and later Amanda Grayson will die in a shuttle accident at Lunaport on her way home from Earth. Commander Thelin, an Andorian Starfleet officer, will become First Officer/Science Officer aboard the U.S.S. Enterprise instead. Sarek serves as an ambassador to 17 planets over the next thirty years in this alternate timeline. "Yesteryear." These events occured when Spock was seven which was in 2237. Spock and T'Pring are betrothed. They share each others minds in the Vulcan mind touch. Hikaru Sulu, future physicist and later helm officer of the original U.S.S. Enterprise, is born. He will become the captain of the U.S.S. Excelsior in 2290. Uhura, future communications officer of the original U.S.S. Enterprise, is born in the United States of Africa on Earth. A starship disappears near the Taurus star system. It will be the sixth and last ship waylaid by the women of Taurus II. "The Lorelei Signal." 27.346 years after the previous ship disappeared, (2214). M'Ress, future relief communications officer on the Constitution-class U.S.S. Enterprise, is born on the planet Cait. Conjecture based on a semi-canon biography once available from Lincoln Enterprises. Assumes she was 22 years old upon graduation from the Academy in 2266. Captain Robert April assumes command of the Constitution-class U.S.S. Enterprise. He will command the starship on a five-year mission of exploration. His wife Sarah April is the ship's first Chief Medical Officer. Conjectured in The STAR TREK Chronology. Leonard McCoy, enters medical school at the University of Mississippi. He will complete an eight-year medical program and graduate in 2253. Pavel A. Chekov, future navigator and tactical officer on the Constitution-class U.S.S. Enterprise, is born. He will later serve as first officer of the U.S.S. Reliant in 2277. Captain Robert April relinquishes command of the U.S.S. Enterprise, to Captain Christopher Pike. Pike's executive officer was a female Starfleet officer whom he called "Number One." Starfleet officer Robert April is promoted to Commodore and becomes a Federation ambassador-at-large. "The Counter-Clock Incident." Twenty years before the episode, (2270). Leonard McCoy, while still a Starfleet medical student, leads a mass-innoculation program on Dramia II. Shortly after McCoy's team leaves, an Auroral Plague kills almost the entire population of Dramia II. "Albatross." Nineteen years before the episode, (2270). Katie Wesley is born, she is the daughter of Robert Wesley, future captain of the Constitution-class U.S.S. Lexington. "One of Our Planets is Missing." Wesley's daughter was eleven years old at the time of the episode, (2269). The planet Cerberus is striken by crop failure during Joanna McCoy's schooling there. Carter Winston uses his personal fortune to save the colony. "The Survivor." Ten years before the episode, (2269). Conjecture based on a semi-canon biography once available from Lincoln Enterprises. Assumes she attended the Academy for four years, graduating from the Academy in 2266. Captain James Kirk relieves Captain Christopher Pike as commander of the U.S.S. Enterprise and the starship begins its historic five-year mission. Carter Winston crashes his spacecraft on the planet Vendor. Winston is nursed by a Vendorian, but will die a year later of his injuries. "The Survivor." Five years before the episode, (2269). In an alternate timeline, Commander Thelin becomes first officer of the U.S.S. Enterprise. "Yesteryear." Five years before the episode, (2269). Carter Winston dies on Vendor of injuries received in a crash. "The Survivor." One year after he crashed, (2264). "Mudd's Women." Stardate 1329.8. The crew of the U.S.S. Enterprise first encounter Harcourt Fenton Mudd. Ensign M'Ress graduates from Starfleet Academy. She will serve on a scout and later on the Constitution-class U.S.S. Hood. Conjecture based on a semi-canon biography once available from Lincoln Enterprises. "Errand of Mercy." Stardate 3198.4. The Starship Enterprise is assigned to prevent an anticipated Klingon incursion at Organia where Captain Kirk clashes with Klingon Commander Kor. This becomes the focal point of the long-simmering dispute between the Federation and the Klingon Empire, threatening to erupt into interstellar war. The immensely powerful Organians prevent hostilities between the two powers and announce the imposition of the Organian Peace Treaty. Kirk will encounter Kor again in 2269. 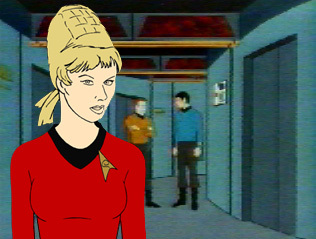 Yeoman Janice Rand leaves the U.S.S. Enterprise. 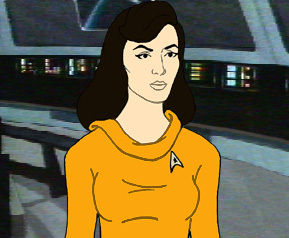 She will receive further Starfleet training and become a transporter chief aboard the refit U.S.S. Enterprise in 2271. Rand will later receive her commission and in 2290 she will serve as communications officer on the U.S.S. Excelsior under Captain Hikaru Sulu. Conjecture. She left after the first season of the original series and was later seen as Transporter Chief Rand in STAR TREK: The Motion Picture (2271). Rand was seen as Excelsior communications officer in STAR TREK IV: The Undiscovered Country and "Flashback" (VGR) (2293). "Shore Leave." Stardate 3025.3. The Enterprise's first visit to the "amusement-park planet." "City on the Edge of Forever." The crew of the U.S.S. Enterprise first encounter the Guardian of Forever. "I, Mudd." Stardate 4513.3. The U.S.S. Enterprise encounters Harry Mudd for the second time. He is left in the custody of androids. "The Trouble With Tribbles." Stardate 4523.3. The U.S.S. Enterprise becomes deluged with tribbles, and Captain Kirk again meets Klingon Captain Koloth who commands the Klingon battle cruiser Gr'oth. "The Ultimate Computer." Stardate 4729.4. The U.S.S. Enterprise takes part in wargames designed to test the M-5 multitronic unit, with disastrous results. The officer in charge of the wargames was Commodore Robert Wesley, commander of the Constitution-class starship U.S.S. Lexington. Commodore Robert Wesley retires from Starfleet to become the governor of Mantilles. Sometime after "The Ultimate Computer" (2268) but before "One of Our Planets is Missing" (2269). Klingon Captain Koloth leaves the captaincy of the I.K.S. Gr'oth and becomes the commander of the I.K.S. Devisor. The Klingons genetically engineer the glommer, a tribble predator. Date is conjecture. This happened sometime after "The Trouble With Tribbles" (TOS) and "Trials and Tribble-ations" (DS9) (2267) but before "More Tribbles, More Troubles" (2269). "Turnabout Intruder." Stardate 5928.5. The Starship Enterprise conducts a rescue mission at Camus II, and Captain Kirk's body is briefly taken over by the consciousness of Dr. Janice Lester. The U.S.S. Enterprise heads for Starbase 2. The U.S.S. Enterprise has a minor refit layover at Starbase 2 and undergoes some design changes including a new holographic recreation room and life support belts in place of environmental suits. The ship's bridge is modified to include a secondary exit located just to the left of the main viewscreen. This must have occured after "Turnabout Intruder" but before "Beyond the Farthest Star." The fact that the refit was done at Starbase 2 is purely conjectural. Lieutenant Arex and Lieutenant M'Ress are assigned to the Starship Enterprise. Arex takes over as ship's Navigator when Ensign Pavel Chekov leaves the ship at Starbase 2. Date is conjectural. Arex and M'Ress were of course not onboard during the Original Series, and Chekov was not in the Animated Series. Arex was first seen in "One of Our Planets is Missing" and M'Ress made her first appearance in "The Survivor." We can conjecture that they came aboard at Starbase 2 during the ship's minor refit period. Harcourt Fenton Mudd steals a spaceship and flees the androids planet. He travels to Ilyra VI where he sells Starfleet Academy to the inhabitants, making just enough credits to travel to Sirius IX. There he discovers a so-called love potion that he sold to over 1000 inhabitants. When they suffer violent allergic reactions from the drug, Mudd flees to the planet Motherlode and he begins selling the potion to the miners there. "Mudd's Passion." Some months before "Mudd's Passion" (2269). "Beyond the Farthest Star." Stardate 5221.3. In orbit of Questar M17, the U.S.S. Enterprise battles an ancient malevolent magnetic organism. Several archaeologists from around the Federation travel to the planet of the time vortex to study the past. The Starship Enterprise travels to the planet to take part. Kirk, Spock and a Starfleet Lieutenant spend some time in Orion's distant past studying Orion prehistory. Aleek-Om and other historians study Vulcan history of twenty to thirty Vulcan years past. "Yesteryear." Just prior to the episode. "Yesteryear" Stardate 5373.4. Spock emerges from the Guardian of Forever to discover that history has recorded that he died at age 7 undergoing the Kahs-wan ordeal. 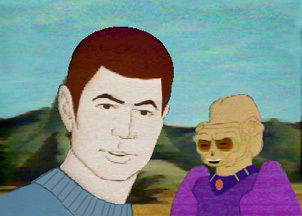 Spock travels back to 2237 to save his own life. Spock is successful in restoring the proper timeline, however this time his pet sehlat dies during the ordeal. "One of Our Planets is Missing." Stardate 5371.3. A huge living cloud that comsumes planets destroys the planet Alondra. Spock communicates with it and prevents it from destroying Mantilles, a planet with a population of 82 million. "The Lorelei Signal." Stardate 5483.7. The U.S.S. Enterprise frees the women of Taurus II from their own glandular secretion trap. Quintrotriticale, a five-lobed hybrid of wheat and barley, is developed. Sherman's Planet again experiences famine. Sometime prior to "More Tribbles, More Troubles." Cyrano Jones steals the only glommer in existense from the Klingons and they pursue his scout ship into Federation space. "More Tribbles, More Troubles." Just prior to the episode. "More Tribbles, More Troubles." Stardate 5392.4. While escorting two robot grain ships to Sherman's Planet, the U.S.S. Enterprise rescues trader Cyrano Jones from the pursuing Klingon battlecruiser, Devisor. The Enterprise once again becomes infested with tribbles, as does the Devisor. "The Survivor." Stardate 5143.3. Patrolling near the edge of the Romulan Neutral Zone, the U.S.S. Enterprise comes to the rescue of Carter Winston, who turns out to be a shape-changing Vendorian spy sent by the Romulans. After commandeering the Enterprise and taking the ship into Romulan space, the Vendorian agent is captured and the ship makes a narrow escape from Romulan vessels. "The Infinite Vulcan." Stardate 5554.4. The U.S.S. Enterprise discovers that the fifth clone of Stavos Keniclius is ruling the planet Phylos. "The Magicks of Megas-tu." Stardate 1254.4. Given the task of exploring the galactic core, the U.S.S. Enterprise is drawn into a parallel universe. The crew are tried by the inhabitants of Megas-tu and are later helped to cross back into our universe by Lucien. "Once Upon a Planet." Stardate 5591.2. The U.S.S. Enterprise returns to Omicron Delta IV, the 'shore leave planet' for rest and relaxation. The planet's computer is running wild and is negotiated with before shore leave commences. "Mudd's Passion." Stardate 4978.5. Harry Mudd is once again apprehended by the U.S.S. Enterprise, after trying to sell love crystals. Mudd abducts Nurse Chapel and briefly escapes to a rocky planet in a stolen Enterprise Heavy shuttlecraft, but he is recaptured and sentenced to an indefinite period in rehabilitation therapy for violations of the Federation pharmaceutical code, including fraud, illegal drug manufacturing, swindling, and transport of a dangerous life-form (a Rigellian hypnoid). "The Terratin Incident." Stardate 5577.3. Responding to a strange distress signal, the U.S.S. Enterprise is bombarded with spiroid epsilon radiation. The crew begin to grow smaller as their molecules contract. They ultimately reach the height of one sixteenth of an inch but are restored to full size by the transporter systems. The lost colony Terra 10 is found to be responsible, and the entire city is spacelifted to Verdanis. In order to learn more about the Federation, Commander Ari bn Bem from the recently-contacted planet Pandro, comes aboard the U.S.S. Enterprise. He spends the next six missions in his quarters. He will finally take an interest in the crew's mission to Delta Theta III on stardate 7403.6. "Bem." Six missions prior to the episode. "The Time Trap." Stardate 5267.3. Surveying the Delta Triangle region of space, the U.S.S. Enterprise and the Klingon battlecruiser Klothos, commanded by Captain Kor, are transported into a parallel universe. The crews of the Starfleet and Klingon vessels cooperate and manage to return to our own continuum. The survey vessel U.S.S. Ariel, under command of Lieutenant Commander Tom Markel visits Lactra VII. The ship's six crewmembers are captured by the Lactrans. "The Eye of the Beholder." Thirty-eight days before the episode. "The Ambergris Element." Stardate 5499.9. The water world Argo is studied by the U.S.S. Enterprise. After their Aquashuttle is destroyed, Captain Kirk and Commander Spock are transformed into water-breathers by the planet's inhabitants. The process is reversed, and the Enterprise crew is successful in diverting a large earthquake. Federation archaeologists discover a Slaver stasis box on the planet Kzin. Commander Spock, Lieutenants Sulu and Uhura set off in the long-range shuttlecraft Copernicus to transport the stasis box to Starbase 25. "The Slaver Weapon." Just prior to the episode. "The Slaver Weapon." Stardate 4187.3. The Copernicus is captured by the Kzinti . A stasis box being couriered by Starfleet is opened, revealing an advanced weapon which eventually self-destructs, killing the Kzinti. Spock, Sulu and Uhura return to the U.S.S. Enterprise aboard the long range shuttlecraft Copernicus. "The Slaver Weapon." Just after the episode. "The Eye of the Beholder." Stardate 5501.2. The disappearance of the crew of the science vessel Ariel, in orbit of Lactra VII, leads the officers of the U.S.S. Enterprise into a planet-sized zoo of specimens from all across the galaxy. The Soul of Skorr is stolen by Tchar, the hereditary prince of Skorr, in an attempt to touch off an intergalactic war. "The Jihad." Just prior to the episode. "The Jihad." Stardate 5683.1. Numerous ships are called to rendezvous with a Vedalan asteroid for a unique mission. A holy war will erupt across the galaxy unless the stolen Soul of Skorr is returned to its people. Kirk and Spock and a group of specially selected beings retrieve it from a Mad Planet. "The Pirates of Orion." Stardate 6334.1. Commander Spock is stricken by choriocytosis and the S.S. Huron, carrying the only cure, stobolin, is attacked and ravaged by Orion pirates. After pursuit by the Enterprise, the Orion pirate vessel is captured intact and Spock's life is saved. The Starship Enterprise escorts an Orion pirate ship and its crew to a Starfleet starbase, the Orions will be charged with high piracy. "The Pirates of Orion." Just after the episode. "Bem." Stardate 7403.6. Commander Ari bn Bem takes part in an exploratory contact mission to Delta Theta III. Bem sabotages the U.S.S. Enterprise crew's efforts in order to learn how resourceful they are. "The Practical Joker." Stardate 3183.3. After escaping from a Romulan sneak attack into an energy cloud, the U.S.S. Enterprise's main computer malfunctions and threatens the lives of the crew. "Albatross." Stardate 5275.6. Dr. Leonard McCoy of the U.S.S. Enterprise is tried for medical malpractice in the Dramen system for the slaughter of the inhabitants of Dramia II, nineteen years ago. He is released after finding a cure for the Auroral Plague which also threatened the crew of the Enterprise. An unmanned probe makes a visit to Earth. When detected it quickly leaves the Solar System. The U.S.S. Enterprise is sent to investigate. "How Sharper than a Serpent's Tooth." Just prior to the episode. "How Sharper than a Serpent's Tooth." Stardate 6063.4. The U.S.S. Enterprise officers meet Kukulkan, a space traveler who visited Earth in ancient times, while tracing the origin of Kukulkan's unmanned probe of Earth. The U.S.S. Enterprise goes to Starbase 22. "How Sharper Than a Serpent's Tooth." Just after the episode. Commodore Robert April and his wife, Sarah, come aboard the U.S.S. Enterprise for transport to Babel. "The Counter-Clock Incident." Just prior to the episode. "The Counter-Clock Incident." Stardate 6770.3. Enroute to Babel with the retiring Ambassador Robert April, the first captain of the U.S.S. Enterprise, the ship crosses over into an antimatter universe, and then returns safely. The U.S.S. Enterprise travels to the planet Babel, however Ambassador Robert April decided not to retire from Starfleet at that time. "The Counter-Clock Incident." Just after the episode.